Ulster University’s new £5.1 million state-of-the-art sports complex opened last week and one of the key design features is Dynamik’s new acoustic wall panels – for both their aesthetics and performance. The hall will not only cater to local and national sports clubs but it will also serve as a major teaching facility for sport and therefore the project specified that it must meet acoustic requirements. The Dynamik acoustic panels have been designed to reduce the mid-frequency reverberation time, therefore creating a comfortable teaching environment for both teachers and students. With a wide range of indoor sport on the new hall’s agenda the panels must be able to withstand the impact heavy balls such as those used in cricket and hockey. For this reason each panels is constructed using a dense birch plywood backing to ensure they stand the test of time in the demanding sports hall environment. The panels are available in a range of wood effect finishes or can be finished to any RAL colour, a refreshing set of options compared to the traditional painted blockwork finish. 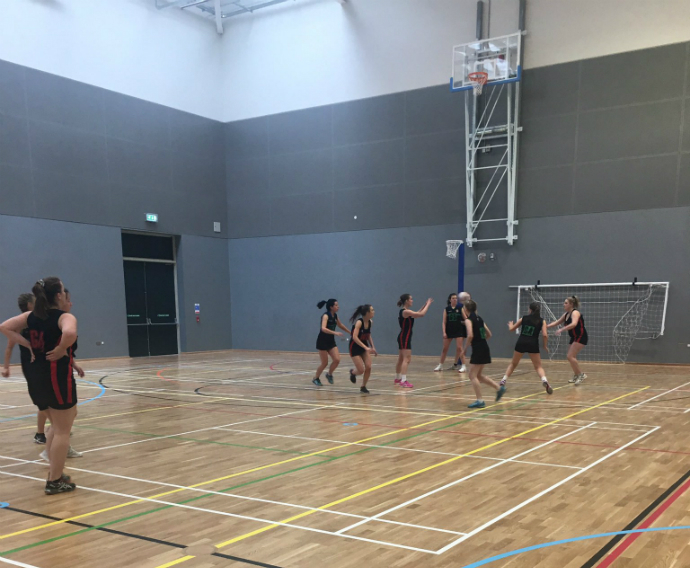 Ulster University opted for a RAL colour finish so they could be designed in to match the adjacent wall surfaces and create an aesthetically pleasing, modern sports hall.